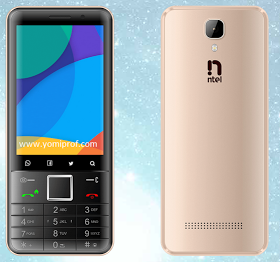 Ntel launches a feature phone called the Ntel Nova , it supports 4G LTE and VOLTE , ' rear ' isn't it ? . This Phone has all the feature and functionality of a smartphone at a feature phone price . This feature phone sports a 3.5 inch touchscreen display , it comes with a 1GB of RAM accompanied with 8GB of Internal storage , it supports 4G LTE and Volte . It has a rear camera of 5mp and front camera of 2mp. Also comes with Android version 6.0 marshmallow . Dual sim support and summed up with a 1800mah battery capacity. Its launching price is about N25,000. You can get one of this phone in their office @ ikoyi or maitama outlet Abuja @ 50% off.